What a charming parting gift given to outgoing White House Chief of Staff Rahm Emanuel at his final Senior Staff meeting this morning. Spokesman Robert Gibbs says it was presented to Emanuel by Austan Goolsbee, the new Chairman of the Council of Economic Advisors. "I talked to the policy team and we wanted to give you a going away present," Goolsbee is quoted by Gibbs as telling the morning meeting of top White House aides. Goolsbee said the staff wanted to give Emanuel "something to show how we feel about you, but also shows we understand your new possibilities." 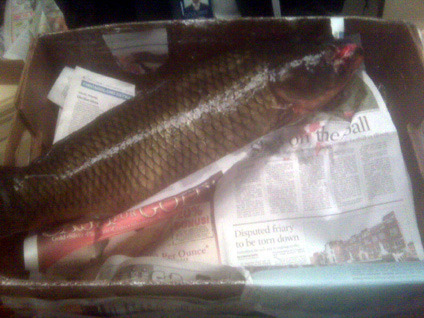 Emanuel unwrapped the present and immediately recognized what it was: "This is a dead fish," he reportedly declared. Actually, it was more than that, explained Goolsbee. ""To most people it looks like a dead fish, but to a future Mayor of Chicago, it looks like a dead Asian Carp." The Asian Carp is the bloodthirsty, voracious and irrepressible species of fish that Chicago is trying to keep from using its waterways to reach Lake Michigan. "In Chicago," said Gibbs, "this is how friends say goodbye." Or as Sean Connery famously said in The Untouchables: "That's - the Chicago Way."